Girl Scouts allow online cookie sales. Girl Scouts Policy Allowing Online Cookie Sales Teaches Valuable Life Lesson… in E-Commerce. Even for Girl Scouts hawking cookies, door-to-door sales is tough—what with the weather and the walking, the doorbells and the creepy next-door neighbors. Luckily for America’s pig-tailed doorstep closers there’s about to be an app for that. After nearly 100 years of selling cookies the old fashioned way—i.e. leveraging your friends and family to boost sales—the Girl Scouts are launching operation “Digital Cookie.” The online sales initiative will soon allow scouts to sell and ship Samoas and Thin Mints using personalized websites or a mobile app. Under the program, each scout may have her own cookie website, which customers can gain access to only if the scout sends them an emailed invitation. No identifying information about the scout may be posted so that it is visible publicly. Another option is a mobile app that includes credit card processing and direct shipping. The digital program begins this month in a limited number of areas where scouts have started cookie sales, and will start nationally in January when most of the 112 Girl Scout councils begin the cookie sales season. 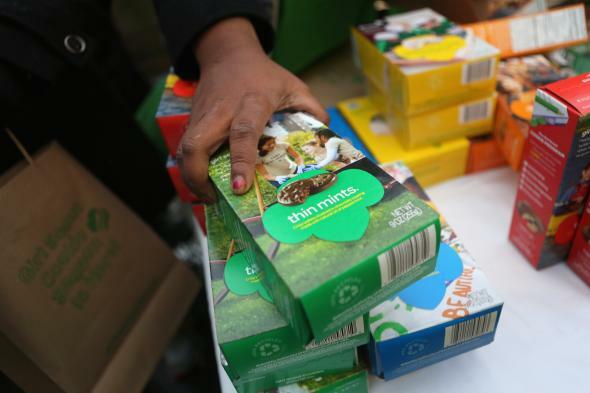 “More than 1 million scouts, from kindergarten-age Daisies to teens, were expected to opt in as cookie-selling season cranks up this month and the scouting organization gets digital sales underway,” the Associated Press reports. “But the tactic is intended to enhance, not replace, the paper spreadsheets used to generate an estimated $800 million in cookie sales a year — at anywhere from $3.50 to $5 a box, depending on scout council.” Yes, project “Digital Cookie” will not replace the beloved paper spreadsheet, said the fax machine salesman.